Artist's Comments: After completing my first flower portrait and happy with the result, I immediately wanted to try my hand at another painting. While enjoying the lush tropical jungle of Maui I came across a thick grove of Rattlesnake Ginger. There were so many blooms all clamoring toward the precious light source that it was difficult to decide which blooms to paint. I wanted to share the sense of a dark dense jungle with a seemingly never ending stretch of flowers growing as far as the eye could see. I achieve the sense of perspective by purposefully toning down the flowers in the distance and keeping the detail and color in the few blooms that were my focal point. 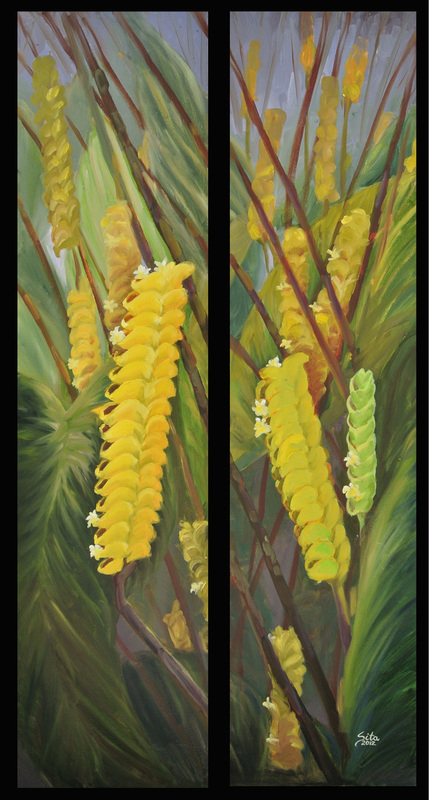 Another interesting element I wanted to capture was the difference between the older ginger blooms which had long flowers stalks similar to the layering of rings on older rattle snakes. The younger blooms had fewer pedals and the youngest of them all were actually a bright green color - turning the rich yellow and gold with age I presume. The size of the canvas I selected allowed me to capture the long, elegant yet ever tangled stalks of the ginger plants. They created such a wonderful geometric pattern that reminded me of playing the game pick-up sticks!